How Do Companies Use Web Developers? Web development jobs at companies that do something besides web development as their main work — which means, most web development jobs — are pretty hit or miss. This list captures some of the good and bad aspects that are likely to come up when working for a company that’s in some business other than web services. Pros: Stable work, or, at least, stable pay even if work is lacking for a while. Serious responsibility creating and maintaining the web presence for companies with real problems to solve. The opportunity to plan and to integrate your work with serious corporate strategies. Cons: Potential for boredom, or manic/depressive work schedules — months of little work followed by weeks of panic as a deadline looms. The most interesting work may go to hired guns from outside, who come and go. Everyone with a “C” at the start of his or her title — CEO, CFO, CTO — is king. Salary: Get your money up front, and a bonus, if you can. Established companies will often pay very well up front for expertise in “name” technologies, but raises will stop as soon as the bloom goes off that particular rose. Benefits: Often solid, sometimes amounting to the kind of “golden handcuffs” that make it hard to leave for new opportunities. Career path: Cash in on good opportunities with an established company, but only stay as long as the work is interesting, and keeps adding “name” technologies and impressive projects to your resume. Answer those recruiter calls — or make calls of your own to recruiters — when the sun is shining. Sometimes you’ll get hired to do web development work for a company that isn’t a company yet. This kind of work is likely to be performed as a consultant or a contractor. It’s tough, because one-man bands — really meaning very small, poorly funded efforts — generally want a lot, and can only pay a little. As in so much else about web work, the trick here is to get a clean, solid definition of the job, and then stick to it as much as possible. Make sure you get paid a chunk up front, and then steadily as you go along, because the strategy, and your assignment, could end at any minute. Working for one-man bands can be very rewarding and a real career-builder and resume-builder too. It produces great networking opportunities as you reach out to people for help, advice, and small contributions of work. Managing the clients’ budgets for them is one of the key skills of working for very small companies as clients. There’s a lot to think about when you consider working as an independent contractor. 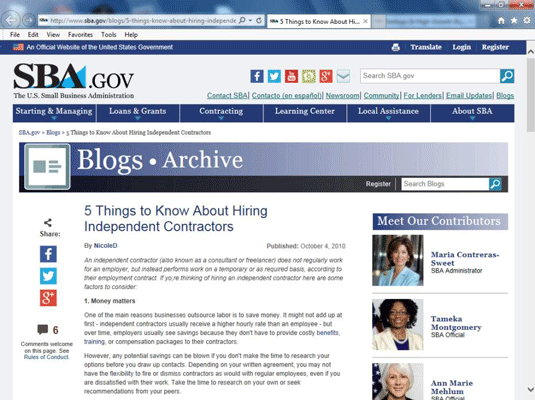 This web page shows advice from the Small Business Administration about how employers think through the decision as to whether to hire an independent contractor. 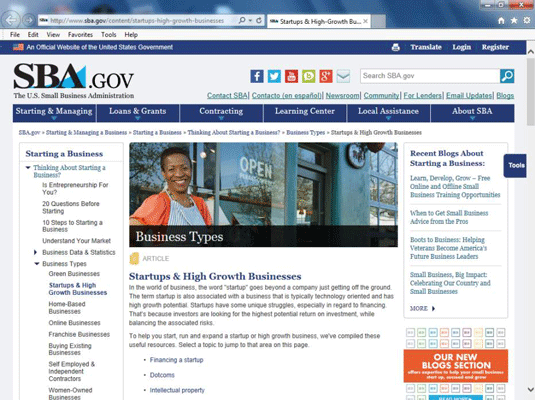 The term startup here is a reference to a classic, Silicon Valley-type startup. Founded with a clear idea of the initial product offering; the initial team’s job is to get that product to market, even if they have to hire a few hundred people to do it. Externally financed, or financed by founders who’ve made money from previous startups, and basically invest in themselves. High-tech company incubators; angels — venture capitalists and other well-off people spending their own money — and venture capitalists spending investor money are the other funding sources. Founded by a small team that’s ready to take on the world, and then beefed up with people who get chunks of stock in the company. Run on a tight time schedule to get a product to market and either getting bought out (in which case, profits may never appear) or going public (in which case, profits better happen and increase quickly). Run on a tight value schedule. Investors want to see a ten times or more return on their money in just a few years. You have to contribute strongly to this kind of value increase, or you’re just in the way. So, what does this mean if you’re a web developer for a startup company? First, your resume could end up looking great. Some of the most exciting web development work is associated with startups, even if the company isn’t very successful. Second, you could do even better than that. You should get a chunk of stock, and that might well turn out to be worth something. Third, there is no better relationship-building opportunity than a startup. “Small” companies can be quite large; there are directories where companies with hundreds of companies can be considered “small.” Conversely, “large” companies can act like collections of smaller ones, an amalgamation of regions, language groups, product groups, and lines of business. On the other hand, you can work at the core of a big enterprise. There is so much money and so much company history in some of these places that you enter a kind of Twilight Zone. Product/services. You make what the company sells. Whether it’s Oreo cookies or high-end consulting services, you are a producer, creating the very thing the company sells. Sales. These people close the deal made possible by the producers. They are the miners who bring home the bacon, to mix metaphors. Everyone else. You can be director of regulatory compliance, head of technical support, VP of whatever. The accountants have one name for you: overhead. In fact, the accountants are overhead too. In a well-run company, there will be people scheming to get rid of you, and replace you with someone cheaper, or outsource your function, or just stop doing it.